Lesson One: Objectives How are the secretions of digestive juices eg. gastrin regulated? Recognise exocrine gland cells, know that fibre content dictates speed of movement through the gut and be familiar with two gut maladies, cholera and the stomach ulcer – and know the case of William Beaumont and Alexis St. Martin. Gastric juices: the secretions of the lining of the stomach, containing hydrochloric acid, salts, and digestive enzymes (e.g.. pepsin). 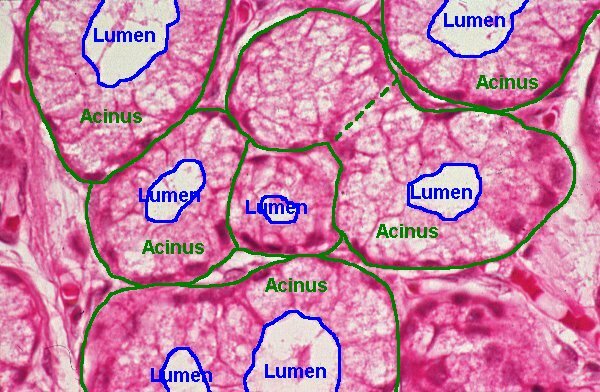 Acinus: a group of secretory cells in a globular arrangement. Dr William Beaumont experimented on an open gunshot wound to one Alexis St Martin. He dangles pieces of food into the gunshot wound hole and then withdraws then to observe the effects at different times. He drinks the digestive juice, and discovers the acidity of gastrin. Q) What ethical questions might be raised by the case of Dr William Beaumont and Alexis St Martin? Regulation is achieved by altering bloodflow, and using nerves and hormones. The vagus nerve is the nerve by which the brain communicates with the gut lining. Sometimes digestion is not required, because either food is not present, or a human body is active – or even running for it’s life. In these times the secretions of digestive juices is halted. 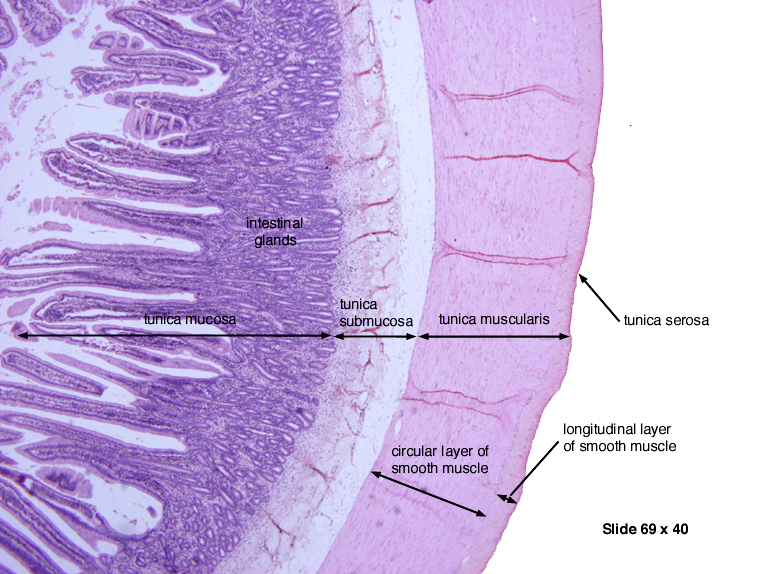 Blood is diverted away from the gut and towards the muscles. Sometimes digestion is a priority activity, such as when resting after a large meal. This leads to a diversion of blood flow to the gut, and away from the brain causing the classic early afternoon sleepiness. How are these secretions regulated? The sight of food (or even the thought in cases), causes the brain to send signals to the stomach lining via the vagus nerve, stimulating gastric secretion. If the pH drops too low (i.e. too much gastrin), two other hormones are released to inhibit gastric secretion (secretin and somatostatin). Q) do these things stimulate or inhibit gastric secretion? 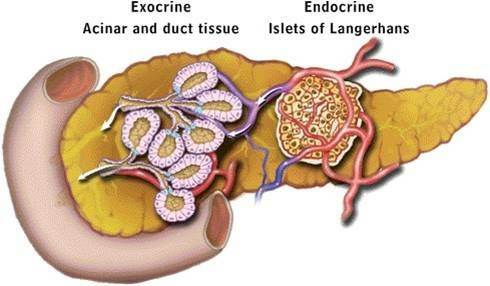 Q) What do the endocrine and exocrine glands of the pancreas secrete? The structure includes a duct lined by duct cells, a basement membrane and secretory cells ( in globular arrangements called acini pl. or acinus sing. ), which are filled with mitochondria, vesicles, and rough endoplasmic reticulum. Q) Explain why the secretory cells are filled with these mitochondria, vesicles, and rough endoplasmic reticulum? another view (intestines). Glands are located in the submucosa layer (stomach and intestine). Mucus is produced by a ‘cup-shaped cells’ called goblet cells, in the mucosa (layer closest to the food). Ouch – two digestion maladies! Stomach ulcers. These are open sores in the stomach lining. These are caused by partial digestion of the stomach lining itself, by pepsin and hydrochloric acid (self-digestion). The acid is important to kill bacteria (barrier system), but it does pose a risk to the stomach lining. So does the pepsin, which is actually secreted in an inactive form -pespsinogen. Even so, sometimes the stomach starts digesting itself…why? What causes stomach ulcers? Chewing gum, coffee, stress? Never proven. Actually scientists have recently identified a bacterium Helicobacter pylori has been significantly associated with stomach ulcers. Stomach acid which splashes out into the oesophagus causes heart burn or classic indigestion. Q) Doctors may prescribe protein pump inhibitors (which slow down the production of acid in the stomach as it pumps acid ions into the ducts), for stomach ulcers or indigestion. Why? 2. Cholera. When a bacterium called Vibrio Cholera infects the colon, it releases a toxin that reverses the absorption of water and salts through the lining of the large intestine. This causes dramatic dehyrdration from watery diarrhoea. Cholera is a killer, and the cause of death is usually dehydration. Some food passes through your digestive system in a matter of 24 hours. Other foods take up to 48 hours or even more. What makes the difference? Apparently the major factor is fibre content. fibre is indigestible food. It allows the food to be moved by peristalsis, by providing bulk to the material. Lower fibre – slower transmission though gut.